Temporomandibular joint dysfunction (TMD) is a blanket term used to describe pain and dysfunction of the joint that connects your lower jaw to the temporal bone on each side of your face (the temporomandibular joint) and the muscles that move the jaw. TMD symptoms include facial pain and tenderness, a clicking or popping sound in the jaw, and the jaw locking open or closed. TMD may also be known as temporomandibular disorder, temporomandibular joint dysfunction, TMJ disorder, TMJ syndrome, TMJ, TMJD, or TM problems. 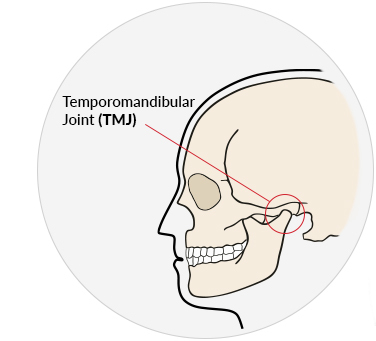 The temporomandibular joint (TMJ) connects the lower jaw (mandible) to the temporal bone in the skull. Located in front of your ears on both sides of your head, the TMJ is sliding hinge joint that can move side to side as well as forward and backward to allow you to talk, chew gum, or yawn. The TMJ and the surrounding muscles and ligaments that support it is considered one of the most complex joints in the human body. There is no firm evidence as to a direct cause of TMD, however, problems with how your teeth fit together (malocclusion), the muscles of your face or the joint itself can play a role in developing TMD. The symptoms of TMD can affect your jaw as well as the muscles in your face, head, neck, and shoulders. Symptoms of TMD can be short-term and temporary, or they can last for many years, becoming chronic. If you grind or clench your teeth while sleeping, your dentist may recommend a mouthguard (dental splint). TMJ physiotherapy can help reduce the pain and discomfort of both chronic and acute TMD and get the temporomandibular joint moving properly again. The TMJ/TMD at pt Health physiotherapists use a combination of techniques to relax, release, and stretch tight muscles and scar tissue. Does TMD Go Away On Its Own? Yes, sometimes TMD can go away on its own without the need for a doctor’s care. In a lot of cases, TMD symptoms are mild, don’t last long, and leave as quickly as they appear. However, TMD can also be a chronic (long-lasting) and a painful group of conditions that can deeply impact your quality of life, at which point treatment is recommended. As there is no known concrete cause of TMD there is little you can do to prevent it. However, you can take steps to reduce symptoms such as our self-care tips below.